Back in September, Satori celebrated its one-year blogiversary with a week full of giveaways. One of those prize packs included Holly Becker’s Decorate book, as well as a mood board and plan for freshening one room. Sarah, author of Journey’s of the Zoo, was the lucky winner and decided it was her kitchen that could use an intervention. House was built in 1974 and is set in the country. Kitchen is currently dark and lacks cohesion. Along with this mood board, I put together a plan including suggestions for the countertop, backsplash, paint, cabinets, storage and styling, as well as links to DIY projects. Like so many people, Sarah didn’t know where to start and now she feels excited about all the great things they can do with the space. I’ve asked her to send me after pictures so we can see the updated and refreshed kitchen. If you think a Refresh My Nest plan is just what you need to begin updating your space, contact me for further details. Thanks Sheila. 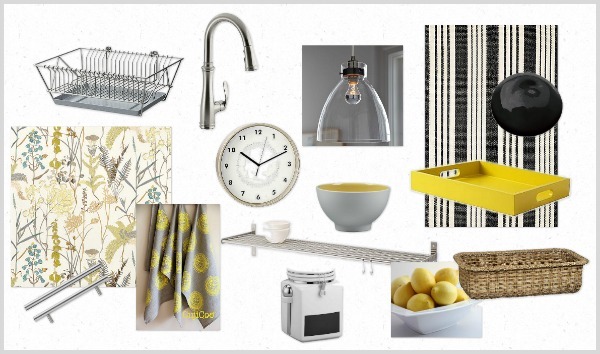 I was excited when Sarah said she loves yellow in kitchens because I’m really liking that color right now. I’m thinking my kitchen needs a little freshening up too! This board looks great! I really like the pendant lights and the baskets. Thanks Brooke. Glass pendant lights are a great solution for small spaces and this kitchen is definitely tight on space! Love the mood board! I’m not sure why, but yellow is such a scary color for me to use. But you have changed my thinking! I love how you balanced the pop of color with white, gray and black. I can’t wait for some “after” pics! Yellow comes and goes for me, but I love the freshness it brings to the kitchen. It’s probably the only place I’d really use it in my house. Thanks for stopping by! I am so excited. Shauna did an incredible job! She really got into my head (scary thought) and came up with ideas that will work for our setting (country), lifestyle (lazy) and budget (frugal). I will definitely come back and let you know when I’ve posted before and after pictures (trust me, that makes me REALLY brave). Thank you so much for your generous gift Shauna, I was so lost. Your suggestions will definitely add value to our home.